Escape from Hipsterville — on the G train. Williamsburg hipsters who need a quick getaway from their high-gloss home turf should hop aboard the Brooklyn-bound G train at its Metropolitan Avenue Station and ride it to the end of the line. 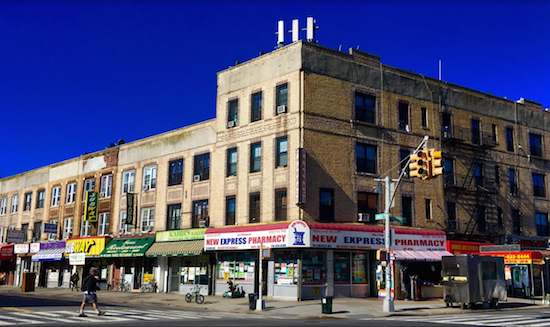 There, on the corner of Church and McDonald avenues, you will find a taste of Bangladesh in the shops and restaurants of Brooklyn’s Bengali immigrant community. This is the Church Avenue Station you’re headed for. The name of the neighborhood you’ll be visiting is Kensington. Immigrants from more than a dozen nations including Pakistan, Poland, Russia, Mexico, Haiti and the Ukraine live in Kensington. There is also a Hasidic Jewish community in the neighborhood. But in the blocks near the intersection of Church and McDonald avenues, the presence of Bengali businesses is especially pronounced. The foodies among you will find the shopping in the area to be pretty awesome. The grocery stores sell things that even the new Whole Foods on Billyburg’s Bedford Avenue doesn’t stock. Some of you probably go to Jackson Heights, Queens, or Manhattan’s Curry Hill on Lexington Avenue around East 28th Street to find these ingredients. If you’re not into cooking, the adventure of eating new things has its charms. When’s the last time you snacked on roasted chickpeas and washed them down with a bottled basil-seed pomegranate beverage? You can buy both at Bangla Nagar Supermarket. See related story. And there are Bengali dishes such as butterfly fish with eggplant and goat biryani at neighborhood restaurants — no-frills eateries that serve up excellent meals. In your stroll around the area, you will notice that many businesses and medical offices have bilingual signs in English and a beautiful cursive script, which is Bengali — a language that evolved from Sanskrit, by the way. There are many intriguing things to see in this corner of Kensington, a neighborhood where an estimated 30,000 to 35,000 Bangladeshi immigrants live. Their homeland, which was formerly part of Pakistan, attained its independence in 1971 after the nine-month-long Bangladesh Liberation War. The first thing that deserves a shout-out in Kensington is something that’s for neighborhood residents rather than visitors. In late October, City Councilmember Brad Lander (D-Park Slope-Kensington-Borough Park) opened a satellite office at 486 McDonald Ave., our Brooklyn Eagle colleague Paula Katinas reported. The office is being staffed twice a week by a Bengali-speaking community liaison, Ruby Abdul. Everything we tried at the neighborhood’s Bengali restaurants was crave-worthy. Ghoroa Sweets & Restaurant at 478 McDonald Ave. served up nicely spiced fish, yellow rice and a cup of milky chai tea. The butterfly fish with eggplant was especially tasty at Abdullah Sweets & Restaurant at 91 Church Ave. This restaurant also makes a traditional Bengali dessert called roshgolla (which is also spelled rasgulla), which are balls of white cheese. We took them to our office and served them in a bowl we bought at U-Need 99-Ȼ Super Store, which is located at 209 Church Ave.
We bought cham cham — boiled balls of dough, very dense and rich, which are also a traditional Bengali dessert — from Radhuni Sweets & Restaurant at 483 McDonald Ave.
For a culinary change of pace, we went to Bobek Deli and purchased Polish cheesecake. It is made with yoghurt and is crust-free. This specialty grocer and caterer at 321 Church Ave. focuses on Polish cuisine, traditional and new. Astoria Bank’s Kensington branch commands one of the corners of Church and McDonald avenues. According to a certificate of occupancy in city Buildings Department records, 101 Church Ave. was constructed in 1936. Inside the branch, there are Art Deco-style desks where customers write deposit slips. Art Deco-style chandeliers hang from the super-high ceiling. The old-fashioned brick building at 130 Church Ave. is wedge-shaped — but it’s a very unusual wedge. One side of the building is curved because the street it’s on, Beverley Road, is curved. Carnival Fresh Market is located in the three-story building. This produce shop, which is open 24 hours a day, seven days a week, stocks intriguing international foods. The owner of the building is S & G LLC, with Saul Rotenstreich as member, Finance Department records indicate. The charming building at 203 Church Ave. is old-fashioned architectural eye candy — and has a kosher Carvel ice cream shop as a retail tenant. The corner of the four-story multifamily building where Church Avenue meets East 2nd Street is snub-nosed instead of straight-edged. The stone windowsills have keystones in the middle of them. Its windowsills and distinctive brick façade are similar to those on the adjoining three-story rowhouses along Church Avenue. Such a lovely limestone row. Then you turn the corner, and there’s another one. The homes on Avenue C between McDonald Avenue and Dahill Road are genteel remnants of a bygone era, with matching squared-off bay windows. Around the corner on Dahill Road, there’s another fine line of similar limestone homes. What a wonderful wedge building. The unusual-looking four-story walk-up apartment house at 262 Dahill Road comes to a sharp point where 35th Street and Dahill Road meet. The property belongs to 262 Dahill Realty LLC, with Moses Mizrahi as managing member, Finance Department records show. The LLC bought it from an estate for $450,000 in 2000, the records show.